I wanted to do a fun post on the Chinese “Year Of” and come to find out it is not only the year of the Rooster but that is MY YEAR! I am a Golden Rooster to be exact and I was born in 1981. Read below to see if you are a Rooster and what that means for you……. Roosters expect others to listen to them while they speak, and can become agitated if they don’t. Vain and boastful, Roosters like to brag about themselves and their accomplishments. People born in a year of the Rooster are typically healthy people. They are active and enjoy sports, such as hiking and swimming. Roosters don’t get sick very often because they tend to fight illness well. Even when they do become ill, they feel better quickly. Roosters are a little sensitive, and they feel stressed and moody at times. 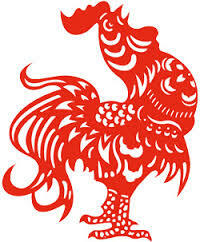 Roosters are more motivated than other animals in the Chinese zodiac, making their careers a priority in their lives. Roosters are hard working, multi-talented, and can deal with a variety of jobs. Good career choices for Roosters are newsreader, sales person, restaurant owner, hairdresser, public relations officer, farmer, athlete, teacher, waiter, journalist, travel writer, dentist, surgeon, soldier, fireman, security guard, and police officer. Roosters are loyal and they make devoted friends. They always keep their promises and are always true to their word. Sensitive individuals may find it hard to get along well with Roosters, because they always brag about themselves and their accomplishments, which may make others uncomfortable. People born in a Year of the Rooster will have mixed weal and woe in this Year. This is mainly because both lucky and unlucky stars will shine on them.